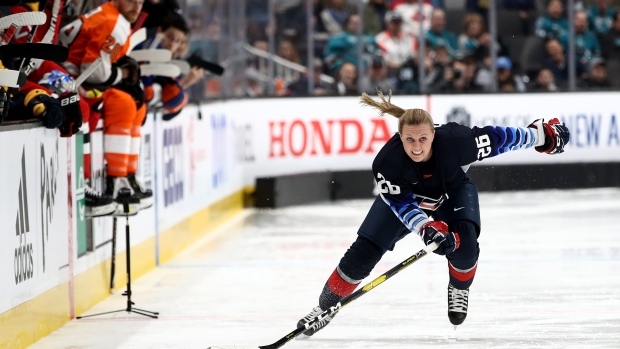 When an injury took Nathan MacKinnon out of the NHL’s Fastest Skater competition at All-Star Weekend, the Colorado Avalanche asked Olympian and US Women’s National Team forward Kendall Coyne Schofield to compete in his stead. She became the first woman to compete in the NHL’s All-Star Skills Competition. Going first, Coyne Schofield posted a competitive time of 14.346 but finished seventh out of eight skaters, edging All-Star Clayton Keller. In the end, the Connor McDavid dynasty continued with a third straight win in the event, at 13.378 seconds. However, even he remarked that he thought Coyne Schofield was the winner. HHOF @CammiGranato on Kendall Coyne Schofield "I was blown away. I thought it was incredible and inspiring. She was a within a second of Connor McDavid. We’ve always wanted to be known as hockey players, not women trying to play a man’s sport. This was another huge step forward." The most popular player at NHL All Star on Friday night. There’s a lot of lightning-quick skaters in the NHL, and Coyne Schofield proved that she can hang with them. Just seeing that from someone that looks like them can be inspiring for so many young girls in hockey across the country, and isn’t that the point of All-Star Weekend? Maybe the NHL will invite Coyne Schofield back next season, and then she can finish the job against McDavid’s reign over the event.